The Avery A2 Precision Guillotine is designed for cutting larger volumes of paper with a self-sharpening steel blade that glides through cutting jobs with ease. As an extra safety feature, the blade safety guard has been designed to move with the cutting blade as it rises and falls so it is never exposed. This A2 guillotine easily cuts through up to 30 sheets of 80gsm paper at a time and with its clear baseboard markings for paper and photo templates, imperial and metric measurements together with degree markings makes cutting more precise. Carry handles designed for safe transportation. Comes with an in-built extra safety locking mechanism. Heavy duty usage guillotine designed to the highest standards. Magnetic backstop is lockable and adjustable to enable accurate repeat cutting. Paper and photograph size templates etched onto the steel baseboard for instant cutting guides. 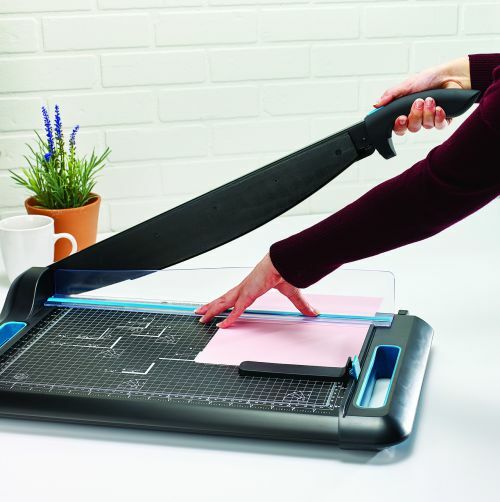 Self sharpening blade provides smooth, accurate cutting action..
Transparent safety guard folds for easy and convenient storage. TÜV certified for safety and quality; an automatic locking system secures the blade when not in use.